Duckweed problems? Nothing seems to get rid of it? The #1 cause of duckweed in your garden pond is low oxygen caused by a buildup of nutrients on the bottom of your pond. Over time your pond will gather leaves, droppings and nitrates. If it is a very large natural pond it is likely it has never been dredged or cleaned which allows the perfect condition for duckweed which thrives on low oxygen and high nutrients. Algaecide won't work. Physical removal won't work for long. Added bacteria will help but not enough. To solve this annoying weed on a smaller system or lined system a full clean out is recommended every few years to keep the nitrate cycle under control and thus keep duckweed out. On a larger system without a liner more involved measures will need to be taken. Before I delve much further into this topic I would like to clarify a few things. 2. If this is a natural artesian pond that runs into local wetlands or watersheds the Herbicidal suggestion below is not recommended and we cannot and will not participate. 3. Nature happens. Personally I like a little duckweed aesthetically but I accept that ponds both manmade and natural are alive and go through stages with the weather and nature around it. Weeds just happen and sometimes that is ok.
Now back to the more involved solutions. If this system is very large and a cleanout really isn't feasible or likely the first and easiest and least expensive solution is added aeration through an aerator system. In tandem with muck pellets and herbicides such as Dibrox over time your duckweed population will decline. However, regular hand removal of the duckweed combined with the herbicide will be necessary for the lifetime of the pond. If a faster chemical free technique is wanted that will have more success and staying power we recommend installing the following additions. 1. A filtration system known as a Constructed Wetland 2. A skimming action created by an Intake Bay 3. Jets to help aid in the skimming process 4. An Aerator. 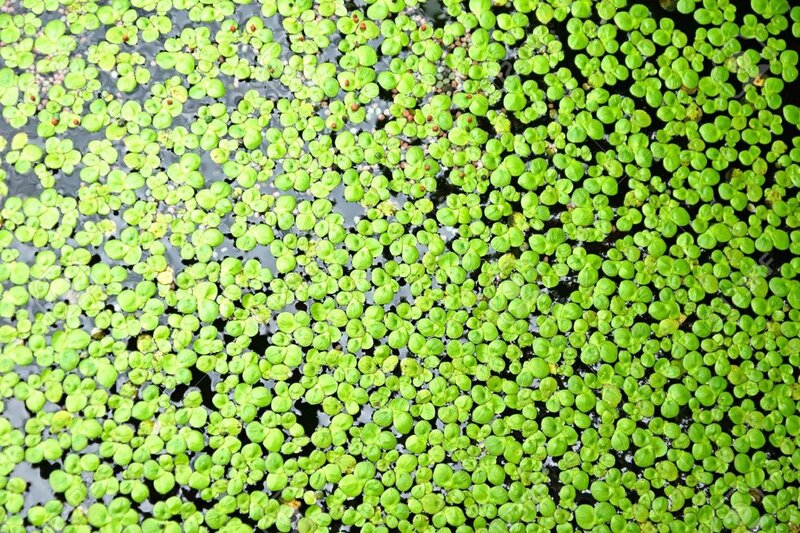 Combined these methods will not only clear up the duckweed but will also greatly improve the overall health of the water column and your pond. By adding the above systems you will be creating a complete ecosystem that mimics nature and offers both you and the wildlife you love a safe and enjoyable paradise.